Companies that sell consumer products usually try to shake things up every now and then to keep things interesting for consumers. Sometimes it’s with the introduction of a new product, a change in advertising strategy, or even changing the packaging that the product comes in. It seems that Coca-Cola is opting for the last option in a new campaign that it will be launching in May. According to a company press release, the four major Coke products – Coca-Cola original, Coca-Cola Life, Coca-Cola Zero, and Diet Coca-Cola – will soon all have labels that feature a red disc. “The Coca-Cola Red Disc has become a signature element of the brand, synonymous with great taste, uplift, and refreshment. By applying it to our packaging in such a bold way, we are taking the next step towards full adoption of the ‘One Brand’ strategy, uniting the Coca-Cola family under one visual identity and making it even easier for consumers to choose their Coca-Cola with or without calories, with or without caffeine,” said Coca-Cola Chief Marketing Officer Marcos de Quinto. The disc will be set on a background that corresponds in color to each of the Coke products. 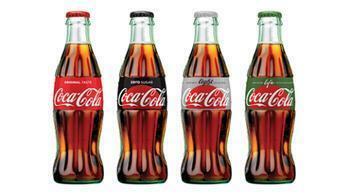 Coca-Cola original will have a red background (making the disk undetectable), Coca-Cola Zero will have a black background, Diet Coca-Cola (or Coca-Cola Light) will have a white background, and Coca-Cola Life will have a green background. Officials at the company are excited for the change, saying that this marks the first time that Coke products will display this level of continuity. “The unification of the brands through design, marks the first time in our 130-year history that the iconic Coca-Cola visual identity has been shared across products in such a prominent way,” said Vice President of Global Design James Sommerville. The visual change will be rolled out to Coke products all over the world throughout 2016 and 2017, but its inauguration will take place in Mexico during the first week of May.